US 6 Roadway (West Shoreway) - The Great Lakes Construction Co. This high-profile project consisted of the conversion of the existing West Shoreway / US 6 into a picturesque boulevard by widening and resurfacing the roadway while constructing a center median with landscaping and lighting from Lake Avenue to W. 25th Street. 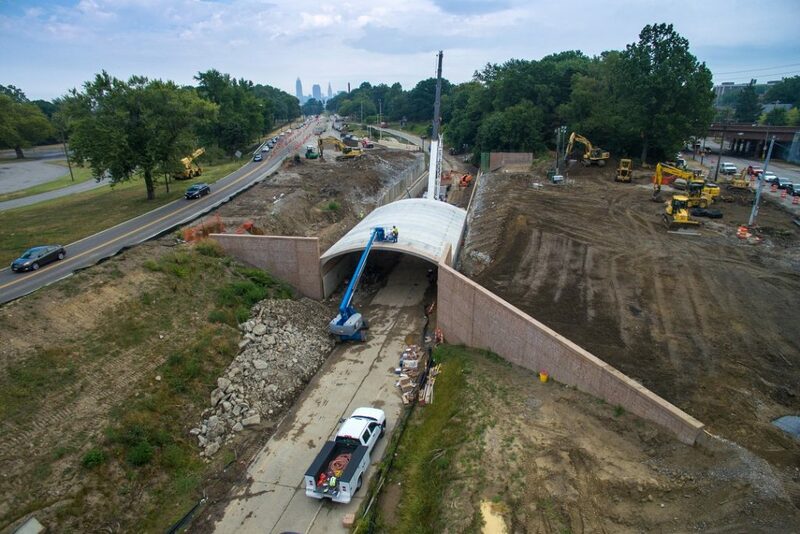 The project included storm sewer drainage, aggregate base, asphalt and concrete paving, retaining walls consisting of drilled shaft with concrete lagging, removal and replacement of the US 6 Bridge over Lake Avenue with a three-sided precast arch, and the construction of a multi-use path. The project has been in planning with ODOT and the City of Cleveland for over 10 years and will provide a dramatic and efficient gateway for commuters, pedestrians and bicyclists to access downtown Cleveland and Edgewater Lakefront Park and marinas. ODOT Cleveland Lakefront West - A Cleveland Urban Core Project!